As guitar players, we know a little bit more about wood than the average person. We have seen the prices of Brazilian rosewood skyrocket. We know that there''s something special about the Adirondack spruce found in pre war Martins. We know that the right wood can make or break the tone of a great instrument, and we certainly know the difference between flamed, curly and quilted. The most important thing however may be the one that we are all overlooking: the fact that the wood so crucial for the incredible range of sounds available exclusively from a high quality guitar is, in many cases, facing imminent extinction. Fortunately, this is a situation that guitar manufacturers are trying to prevent. 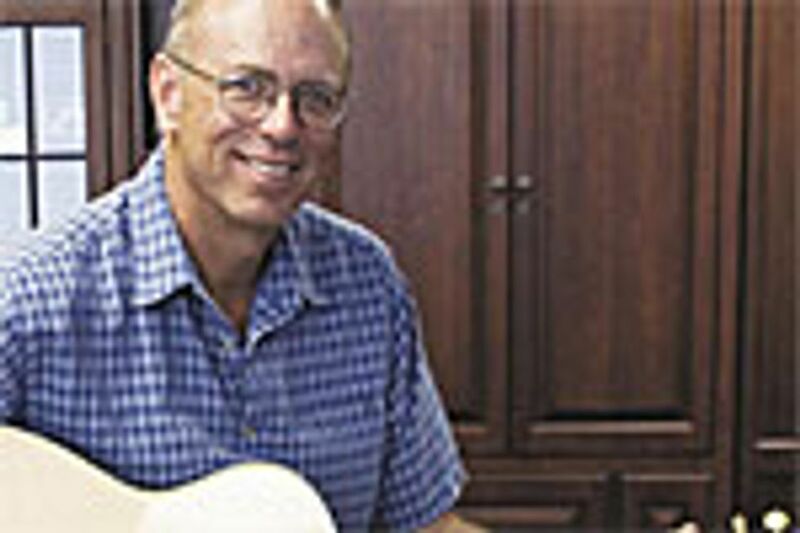 At the summer NAMM conference in 2006, Greenpeace brought together the heads of Gibson, Fender, Martin and Taylor, forming a group known as the MusicWood Coalition to work proactively to create sustainable resources and ensure that quality guitars will be readily available far into the future. For all of these companies, the MusicWood Coalition was not their first foray into environmentalism in the name of music, but it did mark the first time that all four worked side by side toward a common goal. 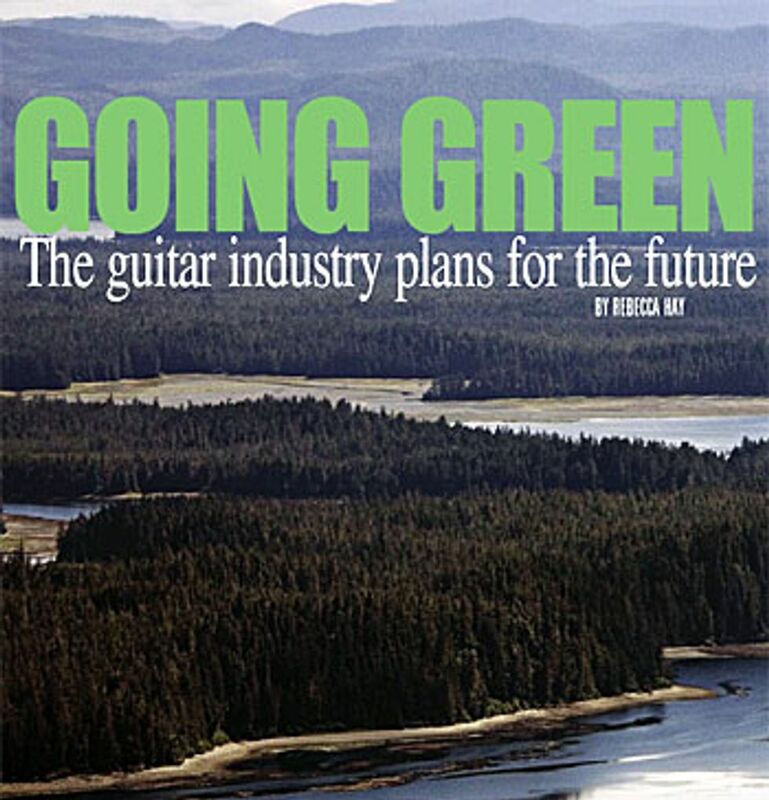 In this special section, you will find all you need to know about the threats to the leading tonewoods, the efforts being taken to save them, and how four of the world’s biggest guitar companies have become the unlikeliest of environmental crusaders. 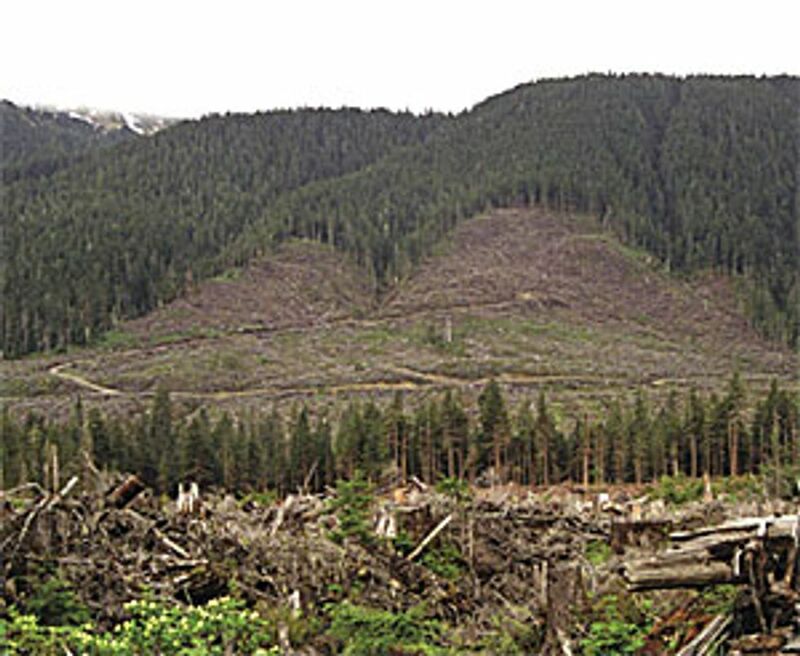 Clearcutting tracts on Revillagigedo Island in Southeast Alaska. The problem of deforestation is not a new one. Forests have been destroyed for land and resources for a long time – Greenpeace estimates that only onefifth of the world’s original forests remain. However, the problem is complicated when dealing with the trees used for guitars: spruce, rosewood, mahogany and others. When it comes to building guitars, the required wood usually must meet certain criteria. Because the same woods used for guitars are also used for many other things like paper and housing, perfectly aged tonewoods are being shipped away for nonmusical uses. Since tonewoods come from all over the world, addressing the problems of the specific areas is especially difficult. In Alaska, the big issue is spruce -- Sitka spruce to be exact. Sitka is used extensively for acoustic tops and for soundboards in other instruments, like pianos. The wood is ideal for these purposes because of its high strength-to-density ratio. Its makeup is unique in that it is strong enough to avoid warping while still being thin enough to produce the best tone. The Sitka spruce is found in select parts of the Pacific Northwest, and in order to achieve the desired tones, the wood must come from trees that are 250 years old, or older. This so-called “old growth,” is rare – only one lumber company in the area has old growth in its forests. The company, located in Southeast Alaska, is Sealaska, owned by Alaskan natives. Here, the old growth of Sitka is being cut so extensively that it could be obliterated in 6 to15 years. Currently, the area is harvested using 99% clear-cutting, according to Greenpeace’s Forest Campaign Coordinator, Scott Paul. 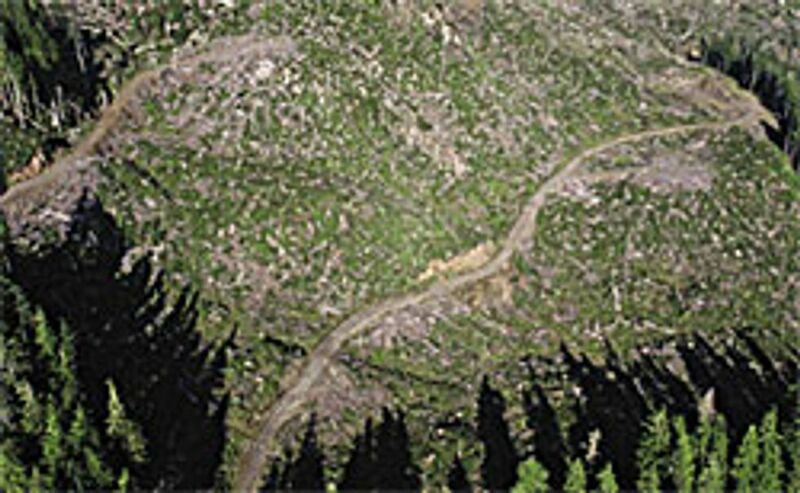 Clear-cutting involves exactly what one might imagine: clearing an area with no regard for the age or type of trees that are being cut, and little regard for which trees are going for which purpose. By this method, a 250-year-old tree that could produce many wonderful-toned acoustic tops could end up lumber for housing in Asia. Clear-cutting tracts in the Tongass National Forest in Southeast Alaska. Though almost all acoustics are currently made with spruce, Gibson CEO Henry Juszkiewicz says that he foresees a future where that will certainly not be the case. At this point, he says, even supply from a sustainable forest will be less than the demand, and alternatives may have to suffice. In Central America, a similar situation was taking place with mahogany. Isolated in reserves, with little or no access to markets for the wood, impoverished residents of these areas had no incentive for managing their forests. Because of this, Central- American forests in Honduras and Guatemala struggled with illegal logging practices. Without incentive to manage the forests, residents had no reason to object when logging took place illegally. It was not simply the act of logging, however, that was obliterating the mahogany forests. The logging was done with little regard to cutting methods. In addition, fires and the spread of agriculture threatened the trees, as farmers cleared trees for farmland. If the problems that face tonewoods weren’t unique enough, the efforts to preserve the precious wood presents an entire new set of difficulties. How does an industry that uses lumber endear itself to a community that is focused on protecting it? It certainly helps that in total, coalition member uses only 150 logs of Sitka spruce each year. To put the number in perspective, a single processing facility will process 150 logs in one day. This minimal usage, combined with the music industry’s visibility, made guitar manufacturers the perfect ally for groups like Greenpeace and the Rainforest Alliance. The steps being taken toward preserving the wood all revolve around a complex process called FSC certification – FSC stands for the Forest Stewardship Council. Certification through the FSC programs involves setting up forests for logging based on the best available science, while taking into consideration all economic, social and environmental concerns. Greenpeace’s Scott Paul says that this is the best hope for keeping loggers, buyers and environmentalists happy. 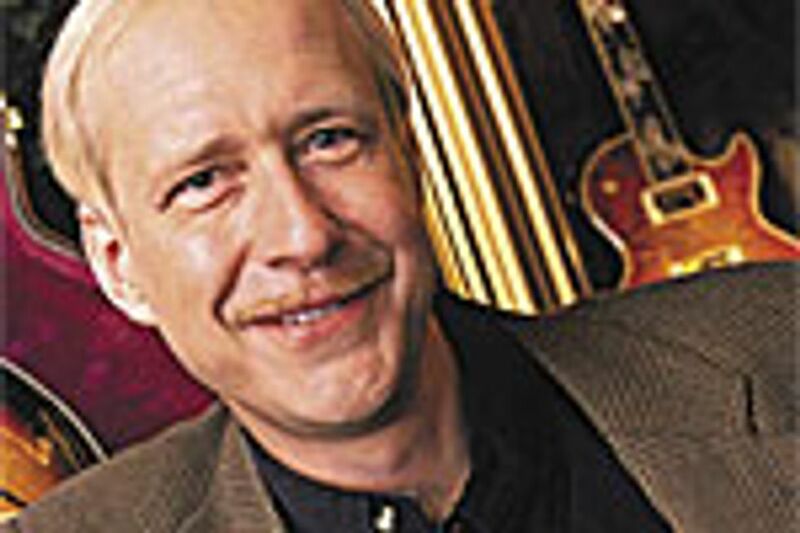 The MusicWood Coalition is comprised of Gibson, Fender, Martin and Taylor, along with guitar companies and wood distributers Walden, Luthiers Mercantile International, Pacific Rim Tonewoods, North American Wood Products and Allied Lutherie. The coalition is a Greenpeace-run program with a long-term goal of addressing tonewood issues around the world. The program’s current focus is getting Sealaska to become FSC certified. If the forests were certified, the Sitka spruce resource would be a more sustainable one. There is a long way to go with Sealaska, says Scott Paul, but progress is being made. Representatives from Sealaska attended the 2007 NAMM conference, which marked the one-year anniversary of the MusicWood Coalition. Greenpeace had been working in Southeast Alaska years before the beginning of the MusicWood program, however. Despite the work being done, FSC certification has not been an issue brought before Sealaska’s board, says Juszkiewicz. “Sealaska knows that they’ve gotta become more green,” he said. However, FSC certification is a long, expensive process that Paul says will take at least a year to complete. Though the MusicWood Coalition has offered to pay a portion of the certification fees, the restructuring and changing of policies is a daunting task in itself. Still, the MusicWood Coalition is hopeful that their visibility will draw larger users of the wood to encourage Sealaska to consider certification. According to Juszkiewicz, the music industry is useful for the more social and political issues, and “the intrigue of dealing with music guys.” MusicWood hopes that this intrigue will be enough to drive change. Guitarists may be familiar with the term SmartWood. Gibson has offered a SmartWood Les Paul for the past ten years, while Martin has made SmartWood guitars for Sting, and also offers the SWOMGT and SWGDT models, made with sustainable cherry and rescued spruce. The SmartWood program is maintained by the Rainforest Alliance. Working alongside Gibson, the Rainforest Alliance has transformed impoverished parts of Honduras and Guatemala into successful – and environmentally friendly – producers of mahogany. In Central America, the two companies work together to train and prepare communities for forest certification. This training manifests itself in multiple different practices that promote sustainability. One such practice is harvesting wood from trees that have already fallen naturally. The actual logging is done without heavy machinery, and is transported by mules. Since the wood is being cut primarily for the guitar industry, trees are cut into blocks specifically for guitar necks. This minimizes waste, and improves transportation. The incentive to change has come through Gibson’s competitive prices for FSC certified wood. Because Gibson is willing to pay more for it, the local loggers themselves have more incentive to harvest the legal, and environmentally friendly way. This income actually has allowed poverty stricken people to send their children to school, and improve their standard of living. The programs have been so successful that Daphne Hewitt of the Rainforest Alliance says that they intend to move into South America to implement similar techniques, and that Martin and Taylor have also expressed interest in pursuing these methods for tropical hardwoods. Gibson, Fender, Martin and Taylor all came together at the 2006 Winter NAMM to discuss the growing problem of Sitka spruce in Alaska with Greenpeace, and there the MusicWood Coalition was formed. We spoke with Henry Juszkiewicz, CEO of Gibson USA, Chris Martin, CEO of Martin & Co., and Bob Taylor, president and co-founder of Taylor Guitars about what had brought them to this point, what they are doing right now, and where they are going from here. How and when did you first get involved in conservation? Juszkiewicz: In the beginning, we searched out whether there were any programs based around tonewood conservation. We found SmartWood, which was small and unfunded. We want to be part of the solution instead of part of the problem, so we got involved. I actually am on the Board of Directors of the Rainforest Alliance. Martin: This probably goes back 15 years; we began to realize that the materials were getting scarcer and the price was going up. We took a closer look at what we were willing to accept and we kind of realized that we had painted ourselves into a corner with the way the wood looked. We also were involved with the Forest Stewardship Council several years ago. We actually walked away from that for a while because they had tightened up the requirements to be FSC certified. We are now back in conversation with the FSC because they’ve realized that they can’t make their restriction so high that nobody can qualify to be certified. Taylor: Our conservation efforts started years and years ago just with our own use of materials. Guitar factories are pretty notorious for eating the heart and throwing away the rind, so to speak. The most basic way for us to contribute is pretty much a lifelong practice of using every drop of the wood we get. How did you get involved in the MusicWood Coalition? Juszkiewicz: We had been in contact with Greenpeace and the MusicWood Coalition; I had given speeches and attended conferences. 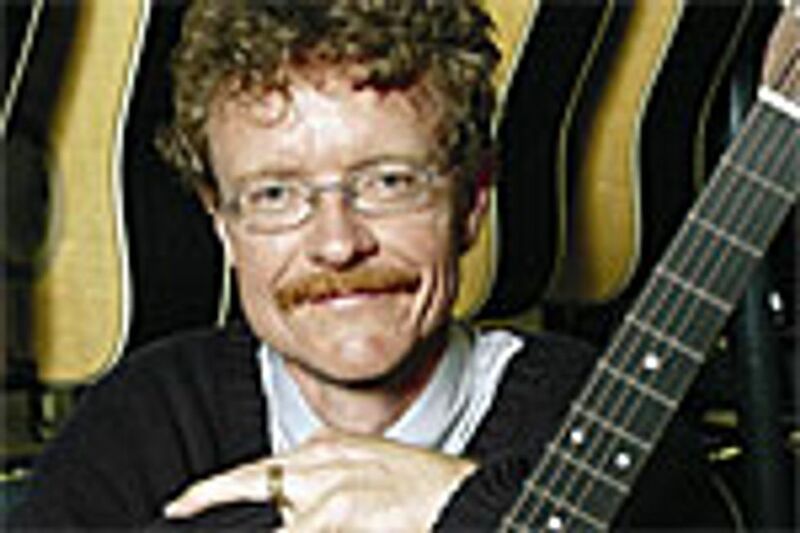 When more specific issues began to be addressed, Greenpeace’s Rob Garner decided to organize the entire music industry. Taylor: We’ve served the wood conservation mostly in terms of tropical woods, but when this Alaskan opportunity came around we felt it would be good to jump on board with Greenpeace and the manufacturers and make our statement. Where are we standing with Sealaska and the Sitka spruce situation? Juszkiewicz: Sealaska knows that they’ve gotta become more green. They are worried about their income flow. There is an idea going around about setting aside a specific area of forest as a MusicWood forest, but that is going to be hard to get done as well. Martin: Where other native Alaskans get royalties from oil, Sealaska has the opportunity to harvest trees. They need to generate revenue for their constituents. They’ll be honest and say that this is not the first time someone from the lower 48 states has come up there with what they think is a great idea. It just has to be a great idea for them as well as for those living in the lower 48. Taylor: Sealaska has offered to take an inventory of their lands and offer as a first step a whole valley of primeval woods and really name it a MusicWood valley. Take some wood out each year, but leave it intact, and then take a look at FSC certifying that portion of their operation. If that goes well for them, then maybe they’ll certify more of their forests. That is kind of where they are at and they are talking about it with an eager voice. Sealaska has been an incredible, receptive listener to everything that we’re saying. They look at our guitars, they come down to the NAMM show and they get a real sense of pride. Outside of Alaska, what other places and woods are you working on? Juszkiewicz: We deal with hardwoods in Central America. There, indigenous people are open to certification, and often the communities have experienced significant economic benefit from certification. Tribes that were poverty stricken can afford to send their kids to school. Sustainability is only one of three major goals, the other two being a regard for native populations and preserving the area’s biodiversity. We are starting a program with the forests in Asia. Lower level instruments use Asian wood, and conservation is not such a big deal in the low end right now. Martin: Well, the Indian government is pretty enlightened about how valuable the rosewood is, and it is actually illegal in India to cut a living rosewood tree. Now, as soon as the tree dies, you can harvest it. It is actually sold at a government auction, and the government charges a commission and gives the landowner that the tree grew on compensation, so that is a good thing. Taylor: We’ve spent the last six or seven years developing a project in Honduras where we buy wood directly from a community of Hondurans. We’ve gotten them to the point where they are really going out on foot with their donkeys and chopping up a few trees each year – I mean a few, like a half a dozen – and felling the trees and cutting them into the lumber sizes we need, which are super-easy to cut into because of our neck design. The old way we made necks could have never done it. That stuff is floated down rivers and shipped to us. Their economy has boomed, the amount of trees that are cut have been reduced to nearly nothing, there are no roads built. So we do a lot of projects on our own. 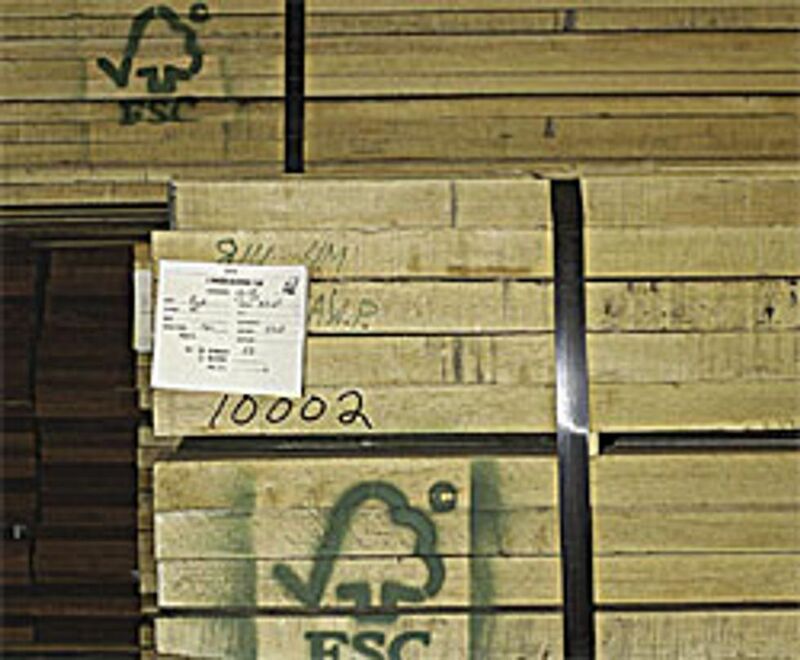 How much of your wood is FSC certified? Juszkiewicz: The reality is, we are SmartWood. Though we have one designated SmartWood Les Paul, most of the products are made with SmartWood. We don’t advertise it because we aren’t doing it for a market advantage – there isn’t one. The SmartWood commitment is not economic, it’s more social. Martin: I hate to admit that it’s not a lot. The percentage is in the single digits. We are used to using big pieces of wood and old trees, so it is going to be a journey. I wish we had all started this fifty years ago. Taylor: Oh, very little of it. It is almost impossible to make an FSC certified acoustic guitar. The reason is that in order to carry the FSC certification stamp, over 70% of the wood has to come from an FSC certified source. The fact is there are little to no FSC certified sources for acoustics. It is a little bit easier to do on electrics. On an acoustic you have seven varieties of wood, and we’ve never been able to do that. What kind of man-made alternatives are you exploring? Juszkiewicz: There is a Hawaiian company that makes a graphite composite top, and we are working on those types of alternatives. Man-made alternatives are capable at some point of being acoustically comparable to spruce. The real question is whether or not the market will accept man-made materials based on aesthetics and tradition. Martin: We actually have a patent on the use of aluminum for the tops of acoustic guitars, so that is one material that we use. We use some processed wood materials, called a high-pressure laminate, and a linen and epoxy mixture called micarta. We have experimented a little bit with graphite on the tops, but there are patents to be conscious of, along with health and safety issues to be addressed. When cutting graphite, a lot of small particulates float through the air; making sure that people have the right type of respirators on is a level of investment in itself. Taylor: We’re not. I’ll switch species of wood before I do. Wood is wood, and graphite and man-made materials aren’t wood. And it affects the way the guitar sounds. I would prefer to make a guitar out of the most unusual wood that you can imagine before I make a guitar out of synthetic materials. How do economics factor into conservation for the manufacturers and the buyers? Juszkiewicz: Getting certified and making more money isn’t a reality; at the same time, there is no penalty, you don’t lose money for “being a good guy.” For consumers, decision-making is more economic. Consumers want it but they don’t want to pay for it. If there are two pieces of wood on a shelf and one is certified, but costs $1.10, while the uncertified one costs $1, the person will choose the cheaper one at the end of the day. Martin: Alternative wood isn’t really that much cheaper. I think that people think if we are going to use an alternative wood, it is going to be half price. It’s not. It’s the labor, not just the cost of materials that determines the guitar price. Taylor: In reality as we’re reaching the end of wood that is available as an existing resource, the cost is going to go up like oil, and it is going up. Our mahogany prices have more than doubled in the last five years, and koa in the ‘80s was $4 for a board foot of it – now it is $75 for a board foot of it. The costs won’t go down. They will just go up. There is no financial upside to this at all. It is just going to get more expensive. Are guitar players aware of the problems facing popular tonewoods? Juszkiewicz: I think they care – there is a lot of information that indicates a real concern. The younger generation especially, in grade school and high school, is much more into the environmental issues. Some consumers know about our commitment to the environment and they feel good about the brand. Martin: We do have customers that want to buy the FSC certified guitars. They’re the people that drive the Volvos and wear the Birkenstocks. Not everybody is like that though. What we’ve covered here is the tip of the iceberg for efforts in conserving tonewoods. Get online and explore the different programs dedicated to the cause. Musicwood.org, smartwood.org, and soundwood.org are good places to start. FSC certification is mentioned liberally when discussing these issues. The actual process of being certified is multifaceted, to say the least. Visit FSC.org to get down to the details of what is really being advocated by organizations like the MusicWood Coalition. CITES protection is another term that is used constantly when discussing tonewoods. It is comprised of different levels of protection that mean more than you might think. Changes in the laws may have a serious effect on traveling musicians. Check premierguitar.com for an explanation of the different levels of protection found on many of the major tonewoods. When buying a new guitar, check out what kinds of wood are used, and if the wood is FSC certified. FSC certified guitars aren’t the most common ones, but it is worth the time to ask dealers for more environmentally-friendly options. Explore alternatives to the most popular woods. We cover some of these alternatives on page 100, and a more comprehensive list can be found at premierguitar. com. For the especially adventurous, consider guitars that have carbon elements, such as tops or necks, or even completely carbon guitars, like the Composite Acoustic guitar reviewed on page 68. Lessening dependence on traditional tonewoods can lighten the burden on those forests – and in some cases, on your wallet.